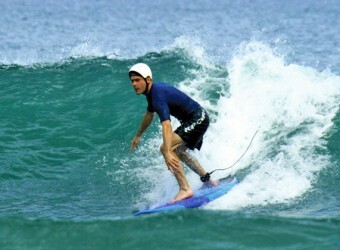 Bali Surfing Rip Curl Surf School offers different days of courses for each level. It is located in Legian Beach along with fashionable stores, and you can enjoy surfing in international atmosphere. Instructors speak English during lesson. Rip Curl Surf School offers different days of courses for each level. It is located in Legian Beach along with fashionable stores, and you can enjoy surfing in international atmosphere. The school is own by the famous surf brand Rip Curl, and their facilities are complete. Choose a course depend on your level. Rip Curl Surfing School has 3 kinds of course for each level. 2.5 hours × 3 days lesson for beniggers. Learn the skills of board handling and board control, paddling, forehand & backhand turn, etc. Also learn safe surfing in the ocean. The lesson is held on beach break with weak wave. Progress and build up the basic skill, and challenge to reef wave surfing. Learn how to control board speed, movement for turn, paddling behind peak of wave, top & bottom turn. Check your progress results after lesson by study book and photo and video of your lesson. Experts course. Expecially, recommended for who want to ride on short board. Master cutback, powerful bottom turn, finish with snap or floater. This program is based on Rip Curl Team Rider Training Manual, and including check your movement by video. - Depend on the level, schedule and lesson program are different. The length of lesson time is 2 hours × 3 days for Beach Surfer and Reef Surfer, 2 hours × 4 days for Power Surfer. Surf school is Group Lesson only. Lesson is provided by English speaking instructor. Children age uner 12 Kids' course is available. Please contact us for details.